Cavalier Plumbing works on your home or business plumbing systems and we repair or replace water softeners, perform drain cleaning, bathroom and kitchen installation and repairs and sprinkler systems. We can repair, rebuild or upgrade any plumbing in your home or business. Our main concern is that your systems are the quietest, healthiest and most efficient possible at the lowest possible cost to you. We tell you what it will cost before we do the work and we aren't satisfied until you are satisfied. It's the way we've been doing business in Utah since we started our business over 25 years ago. We are the affordable plumber! 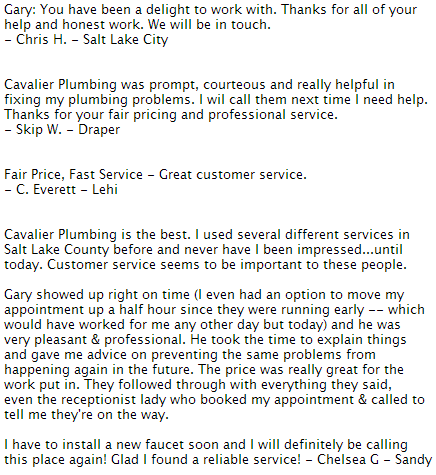 Cavalier Plumbers are the best that you will find in Utah. Our technicians are licensed, clean cut and drug free professionals. They are all carefully screened, background checked and trained to provide you with the safest and most highly skilled professional plumbing service available anywhere. Our plumbers will treat you and your home with the highest level of respect. Cavalier Plumbing specializes in all types of water heaters. Choose from standard gas, or electric water heaters, a wall mounted instant hot water or a system that will give you unlimited hot water as well as heat your home, warm your floors and melt snow on your driveway! Our technicians are extremely knowledgeable in all aspects concerning water heaters. They will diagnose and make repairs to solve any problems with your existing water heater and will give you a price and guarantee that price in writing before making any repairs. That's the way we've been doing business for over 25 years! If a replacement is needed, you can be assured that your new water heater will be the most energy efficient. The venting will be save and up to code and properly "green stickered" to Questar Gas standards. Cavalier Plumbing offers quality sewer cleaning, repair and replacement services. Our technicians are well versed in how to diagnose and treat sewer problems, and hiring the right sewage professional can help you save a lot of time, money and future headaches. If you are in need of a quality sewer cleaning, repair or replacement, don't hesitate to call Cavalier Plumbing today! Re-piping is a process of removing or bypassing an existing system in a home, building, etc., weather it is a fresh water intake or a drainage system. Re-piping your older home will increase your comfort, convenience and peace of mind as well as the resale value of your home. Whole home re-piping is a serious project. Cavalier Plumbing offers full service solutions that include leak detection, plus repair or re-piping. Our specialists provide a complete and thorough diagnosis to ensure accurate resolution. It's a job for the plumber who has the experience, training and equipment to do it right the first time. It's a job for the plumber who will guarantee that the project will be finished on time, guarantee that the materials used are top quality and all work performed meets governing installation codes; guarantee that you and your home will be treated with the highest respect: and guarantee not to leave your home until you are 100% satisfied. Cavalier Plumbing is your best choice for plumbing service in Salt Lake County. No matter what your plumbing crisis is or if you just want to improve your water conservation efforts or if you are building a new home or commercial building, we hope that you will give us a call and allow us to become your preferred plumbing company! 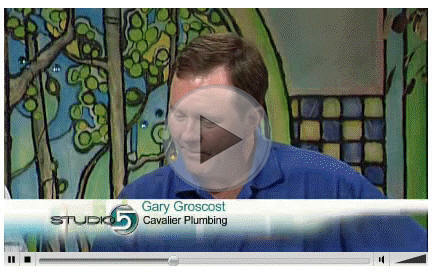 Gary Groscost, owner of Cavalier Plumbing was recently featured on KSL's Studio Five program to demonstrate some of the new and advanced features available in new shower technologies from Cavalier Plumbing. of your family for decades to come!